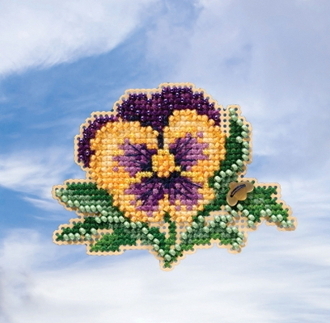 A beautiful Ornament kit to cross stitch featuring a Tricolor Pansy. Makes one ornament to hang or use the enclosed magnet to decorate any metal surface! Finished size: 3"w x 2.25"h (7.6cm x 5.7cm). Mill Hill Glass Beads, Mill Hill treasure, Mill Hill Perforated Paper, floss, needles, magnet and chart with instructions.